Yesterday the EUR/USD currency pair tried to start a corrective movement, but managed to reach only the middle of a descending structure. We may assume that the market is trying to define the depth of a future descending movement. The target of this structure is at 1.2752. The pair is expected to move for a while inside a narrow range and then continue falling down. 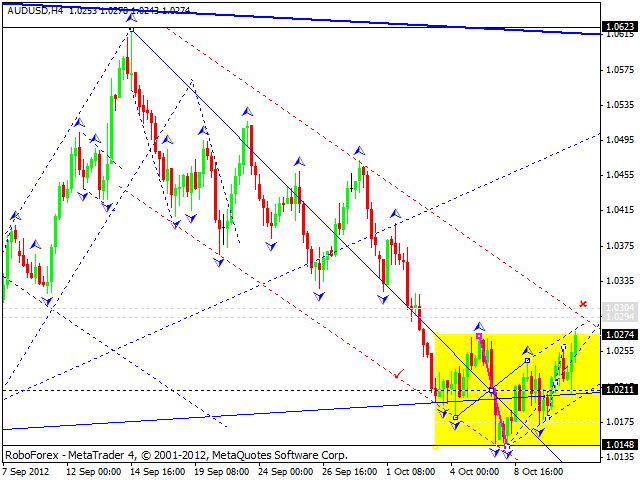 The GBP/USD currency pair is consolidating inside a narrow trading range. Yesterday the market tried to leave the range and finish a corrective movement, but managed only to complete another candlestick below 1.620. Today we can see some signs of a possible “triangle” pattern, which may be formed in the future. Thus, the market is slowing down a bit before continuing moving downwards. If the price breaks the pattern’s lower border, the pair may continue falling down towards the target at 1.5720 without any serious corrections. 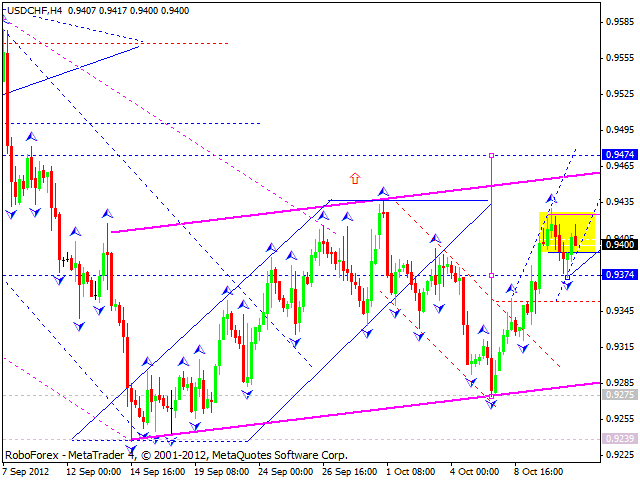 The USD/CHF currency pair made a slight corrective movement yesterday and then continued growing up. Today the price is expected to continue moving upwards to break 0.9430, reach the target at 0.9470, and then consolidate inside a narrow trading range. So, in the future the market is going to continue growing up. The structure of the consolidation will help us to define the target of the growth. 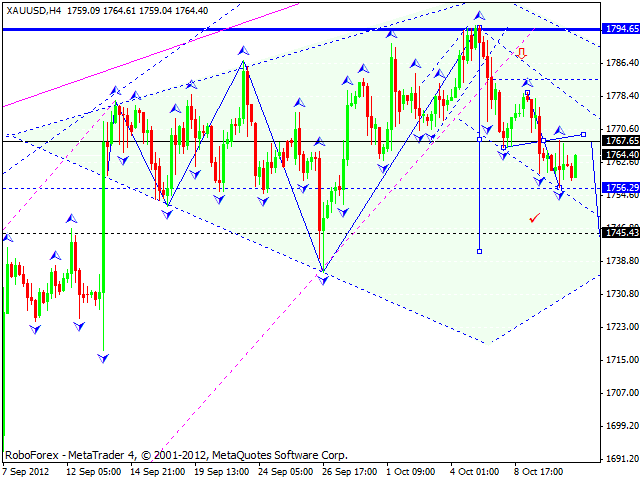 The USD/JPY currency pair faced a resistance at the “triangle’s” upper border. 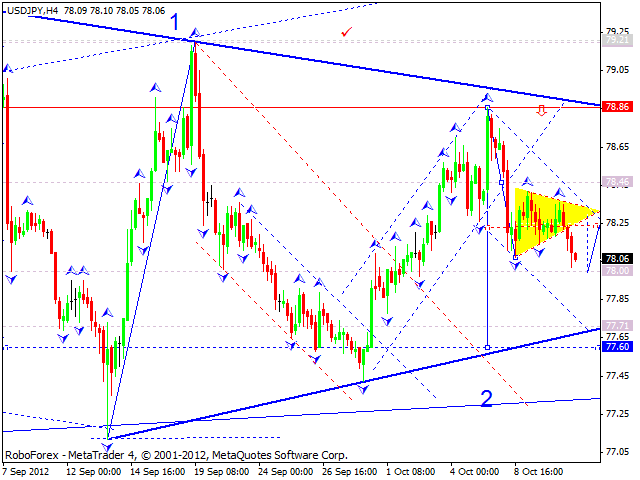 Today we can see that it was broken downwards and expect the price to reach the target at 78. Later the pair may return to test the pattern’s broken lower border from below and then continue falling down and reach 77.70. 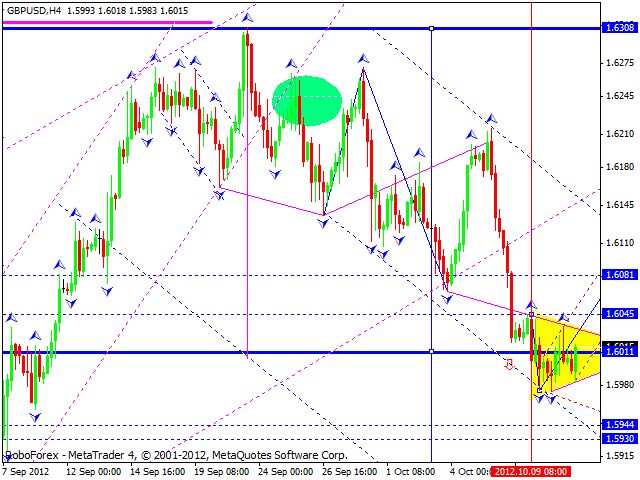 Australian Dollar continues forming a continuation pattern. 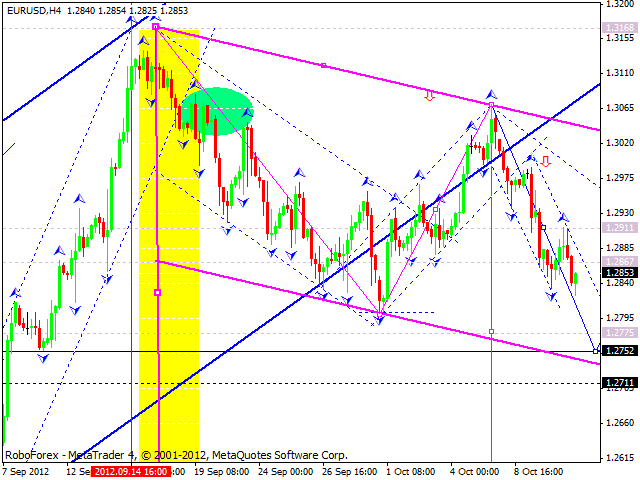 We can see that the pair is trying to reach the target at 1.0300, which is near the descending channel’s upper border. Later the price is expected to breach this structure downwards and continue moving downwards. Gold continues moving downwards, it reached the target at 1756, and today is going to test the level of 1767 from below. Later the instrument is expected to continue falling down to reach 1745, and then start more serious corrective movement towards the level of 1780.